the state of Arizona. Call Today! Quick Response Garage Cabinets makes upgrading your garage storage easy. Our free in-home estimates include and walkthrough of your garage, physical cabinet samples for you to compare, countless pictures of alternative colors and styles, and an overall project layout for your consideration. Our professional staff will answer all your questions and help you pick the garage storage solution that makes the most sense for you. WHY CHOOSE QUICK RESPONSE GARAGE Cabinets? We put the customer first! Our goal is to educate customers about their garage storage options and what to expect from the work we provide. We provide accurate price quotes and reliable time-frames for how long it will take. Quick Response Garage Cabinets is proud to be family owned and operated. We began building and installing garage cabinets in 1999. We install a great product built from scratch by us in our cabinet shop here in the Phoenix area. All of our installers are background checked for your safety and comfort. We include a limited lifetime warranty on our product and labor. Ask us about our laundry room cabinets as well. We offer four colors to choose from, and adjustable shelves for your storage convenience. In-home estimates are always free, and we can go over size, colors, layout, and get your install scheduled usually within a week or sooner. Free in-home estimates include a walkthrough of your garage, physical samples for you to compare, countless pictures of alternative colors and styles, and an overall project layout for your consideration. We’re proud to be family owned and to service locations throughout the state of Arizona, Valley-wide and Tucson too! We provide storage solutions for any size garage with options to fit your needs. Renovating? Epoxy Your Garage Floor First! Some of the reasons that epoxying your garage floor will make a world of difference during a remodel. Is It Time to Clean Out Your Garage Cabinets? Reasons to add epoxy flooring now. Some of the reasons you may want to consider flake flooring for your garage floor. 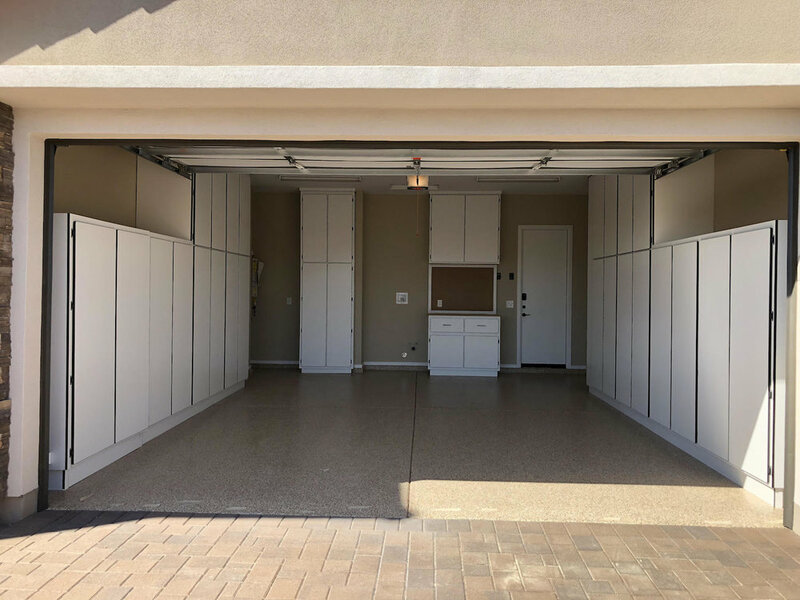 Epoxy is a tough, extremely versatile option which is easy care and will make the garage safer, cleaner, and more attractive at an affordable price. If you watch a flooring company create epoxy flooring, you’ll notice that each step in attended to with precision, and that every square inch of the floor is treated with the same loving care. Methods and products to keep epoxy flooring looking its best.